The 8 Best Taco Joints in Wyoming! Mexican cuisine holds steadfast to fresh ingredients, simply prepared, and bursting with flavor. The glorious street taco is the ideal manifestation. If a Mexican restaurant boasts authenticity, the food and ingredients are left to speak for themselves, without unnecessary flourishes. And in a rural frontier state, Wyoming boasts an excellent spread of the best that our southern neighbors have to offer. Here are the eight best taco places in Wyoming! In the restaurant industry, there always exist the (sometimes) conflicting pulls of modernization and authenticity. While Hatch respects and implements the best aspects of Mexican cuisine, it certainly takes the more modern route. The drinks and tacos are cutting-edge, with the millennial appeal of non-GMO tortillas, organic produce and gluten-free & vegan options. Add to that the largest tequila & mescal section in the area, and this taqueria assures a classy and delicious tour through the ritzier areas of Mexico. The smoked pork or grilled salmon tacos are particularly delicioso. A street taco menu isn’t complete without the real ingredients: lengua, tripa or cabeza (tongue, tripe or brain). If these preparations are on the menu, the tacos will definitely be deliciously authentic, if not authentically delicious. 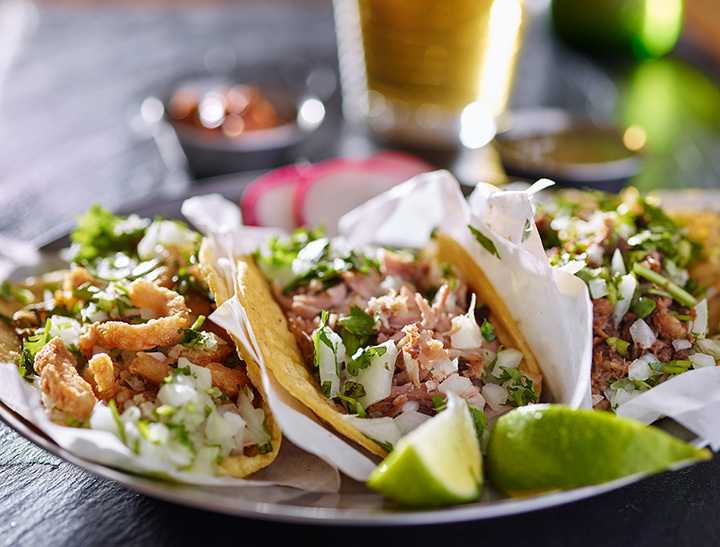 Fiesta not only boasts a commendable tequila menu, but more importantly, it’s burrito and taco selection is both mouthwatering and true to its roots. If certain organs aren’t one’s forte, the friendlier birria is a fork-tender braise of pork cheek and spices. Bringing a uniquely Texan flair to Mexican cuisine, this Tex-Mex makes use of beef, beans and other American-ethic novelties. And the longevity of the establishment, in a region awash in money and tourism, is a testament to the tacos. The delicious, fresh chips and house-made salsa foretell a great meal to come. The classic al pastor tacos are primo: savory, slightly spicy pork is marinated and braised in a sweet-tangy chile-pineapple brine. This restaurant melds the grounded, no-frills simplicity of the taco truck with the family-friendly crowd pleasing atmospheres of chain restaurants. The taco menu checks all the boxes: limited wording, offal and organ meats, and affordability. While the lengua is delicious, and the heaping sides of rice and beans comfort like abuela’s house, some interesting novelties are surpising. The fiesta taco combines a savory and toothsome steak with soft nopales (cactus petals) and avocado. Unknown to the world, but important to the frontier West, Rock Springs is an isolated, windy, rural town. But surprisingly, it brims with the families and cuisines of its historical workforce: especially those from Mexico and Eastern Europe. And Fiesta brings a subtle twist to traditionally Mexican cuisine: Guadalajaran. The capital of the state of Jalisco, this second-largest Mexican city is nuanced and complex, a culinary residue of the commingling of indigenous with Spanish and other European cultures. As such, this restaurant pleases the picky and the passive, melding the familiar with the authentic, the subtle and the boisterous. This Casper institution is unique in two primary ways. First, its trademark isn’t the usual street taco or burrito, but it’s particularly good, flour soft-shell (a rarity for traditional tacos). Second, it hosts a rare gem of Mexico: the panaderia, or bakery. The pastries and sweets showcase an oft-overlooked, and quite central, aspect of Mexican cuisine. But that said, the taquitos, tamales and street tacos hold their weight, representing the best of Chihuahuan-style cooking (hence the flour tortilla). The carnitas, al pastor and chicken tacos are all stellar. Food made from scratch, every day. This is a maxim so ubiquitous in Mexico, that it needn’t be mentioned. But for many American food establishments, this quaint notion simply cuts into profit. Corona makes its ancestors proud with fresh made food, daily. This family joint produces some tasty tacos. The shredded beef is a great go-to. Certain major franchises become that way for a reason: they do things right. The crunchy tacos easily outshine any comparable competitor. There are two other assets: the delicious, hot green salsa and early hours that make tacos for breakfast an easy routine to adopt. Check foodie smugness at the door and embrace paper-wrapped tortilla simplicity.